Credit Life office building by Miller & Favazzo Properties - quality real estate development and property management. This building was built for the world headquarters of Credit Life Insurance Company and was designed by Skidmore, Owings, and Merrill. 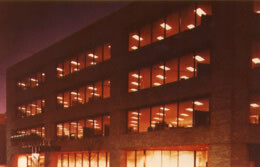 The building, which is located in downtown Springfield, Ohio, was completed in 1975 and provided 70,000 SF of commercial office space.